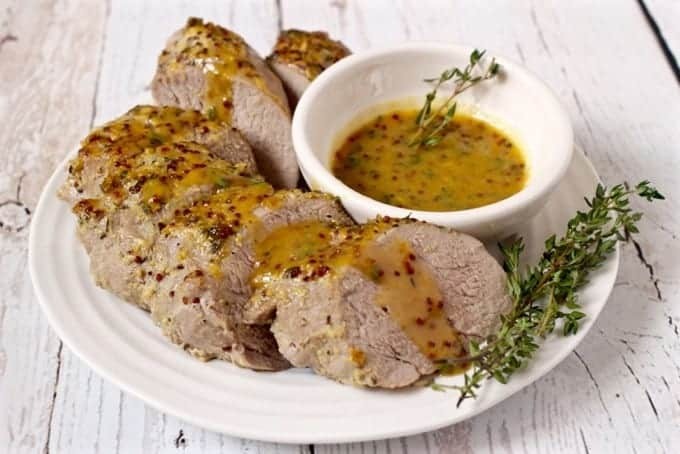 Roasted maple-mustard pork tenderloin makes for a hands-off, delicious dinner! Line a baking sheet with tin foil for easy cleanup. Spray with cooking spray. Mix Dijon mustard, coarse mustard, maple syrup and thyme in a small bowl. Place pork tenderloin on prepared baking sheet and season with salt and pepper. Rub mustard mixture over pork tenderloin, reserving about a tablespoon of the mustard mixture to drizzle over the pork before serving. Put pork tenderloin in oven and roast at 400 for 20 minutes, or until done. Slice the pork, drizzle with reserved sauce and enjoy! © 2015 Family Food on the Table. All rights reserved.